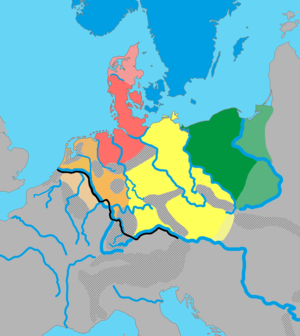 In its broadest sense, the term Ancient Germanic culture can be used to refer to any culture as practiced by speakers of either the Common Germanic language or one of its daughter dialects (Gothic, Vandalic, Burgundian, Lombardic, Old High German, Old Frankish, Old Saxon, Old Frisian, Old English, and Old Norse) at any time during the roughly two millennia between the emergence of Proto-Germanic in the Nordic Bronze Age (ca. 1000–500 BC) until the Early Middle Ages (ca. 500–1000 AD). Although 'Germanic' can only be used with any sort of definition in a linguistic sense, the degree of cohesion and relative conformity which existed in ancient times between the various groups of Germanic speaking peoples in terms of mythology, religion, customs, social structure and material culture is seen to justify the use of the term to refer to the culture of those peoples as a whole. The ancient Germanic people made a considerable impact on the development of ancient Europe, particularly through their interactions with the Roman Empire. They have been variously portrayed in the annals of history; sometimes as 'barbarian hordes', ultimately responsible for the Fall of Rome; at other times, as 'noble savages' living in blissful ignorance of the evils of civilization; at still other times, as Rome’s most enthusiastic supporters and eventual successors. Regardless of how one judges them, it is certain that the ancient Germanic peoples changed the face of Europe – and through their descendants, the world – dramatically. The Limes Germanicus (Latin for Germanic frontier) was a remarkable line of frontier (limes) forts that bounded the ancient Roman provinces of Germania Superior and Raetia, and divided the Roman Empire and the unsubdued Germanic tribes, from the years 83 to 260. At its height, the limes stretched from the Northsea outlet of the Rhine to near Regensburg on the Danube. The proper Rhaetian Limes extended east from Lorch to Eining (close to Kelheim) on the Danube. The total length was 568 km (341 miles). It included at least 60 castles and 900 watchtowers. Gamla Uppsala, the centre of worship in Viking Sweden until the temple was destroyed in the late 11th century. ... that Pope Boniface II (papacy 530 to 532) was an Ostrogoth? ... that Arminius, the Cheruscan warrior who successfully united several Germanic tribes (Cherusci, Marsi, Chatti , Bructeri , Chauci and Sicambri) to fight against and eventually defeat three Roman legions in the Battle of the Teutoburg Forest in 9 AD, had been trained as a Roman military commander and possessed Roman citizenship? ... that the parapets of the Hagia Sophia in Istanbul are known to contain two Viking age runic inscriptions? ... that, according to Tacitus, Germanic people were piously monogamous, and that an adulteress was driven from her home by her husband wielding a whip? ... Germanic warriors would bring family members along to battles, to urge them on during the fight? Add nice pictures to the Selected picture module. Add good articles to the Selected article module. Update the 'Did you know...' module with more interesting facts. Consider adding new modules such as 'Selected biography', 'Selected location', or 'Selected artifact'. Tag relevant pages with a Portal link. The Ramsund inscription is a runic inscription from the early 11th century in Södermanland, Sweden and which depicts the legend of Sigfried known from later Germanic sources such as the German Nibelungenlied and the Icelandic Völsunga saga. In modern times the story has been part of the inspiration for works such as the Lord of the Rings and Der Ring des Nibelungen.